Mach 3 was a pseudo 3D racer which was released on the Amstrad (http://www.cpczone.net/game/2087), MSX and Spectrum (http://www.worldofspectrum.org/infoseekid.cgi?id=0002959), but it seems not on the C64 as stated to be coming soon by TGM in issue 03/88. Even though the game was a bit crap, we still want to try and find out what happened to the planned c64 conversion. It might be another case of Titus-syndrome, where the Amstrad was deemed more popular in France, and hence the C64 version wasn’t deemed relevant. However, strangely the Spectrum version was not really reviewed in any of the key UK magazines and may have only had a limited release on a compilation. Maybe Loriciels thought the game was bad and decided to ditch any C64 conversion they may have had underway (No doubt probably starting that conversion as it was the least popular platform in France etc). We know little more about the game at this stage and its C64 release, but hope soon to learn more and maybe find out if this was more than just vaporware on the C64. 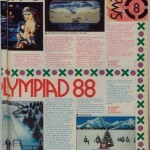 C+VG issue 77, review, P30+P31 has C64 version down.